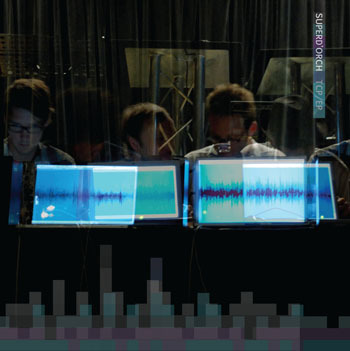 SuperD'Orch is a digital orchestra. It was set up in 2009 as a combination of two research project briefs: to form and perform as a digital orchestra, and to use the audio programming language SuperCollider to build a performance environment. The project explores the various issues that come with setting up a digital orchestra, which include issues relating to composition, performance and technology. After much discussion, the group settled on the concept of a 'meta instrument'. SuperD'Orch then built project specific software applications using SuperCollider and Max/MSP which work together in various ways across the groups five laptops. Our performances are typically comprised of several musical pieces, each exploring a different compositional approach based upon the idea of the 'meta instrument' and the various ways in which it can be set up. All tracks produced and arranged by Pete Clarke, Gisli T Gudmundsson, Gavin Fort, Christian Baker and Liam Webster. Mastered by Liam Webster. 2009. TCP / EP by Super D'Orch is licensed under a Creative Commons Reconocimiento-NoComercial-CompartirIgual 3.0 Unported License.